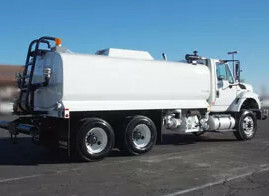 A solution to your grading, cleaning, dust control, and water needs for any industry. 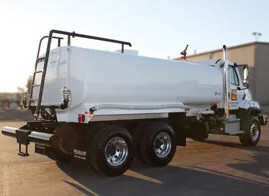 All water trucks are manufactured and designed by McLellan and can be customized to your specific need, including a stainless steel option. 4000 gallon, 'A' style tank. - A stronger shell with better structural integrity that will extend the life of your truck. - 1/4 inch (0.635 cm) double-welded bolsters double the strength forming a tube like section. Superior design versus a typical "L" shaped single-weld bolster. 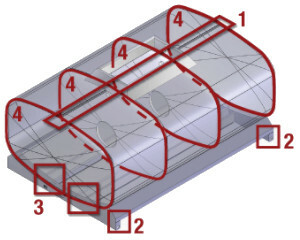 - Lengthens tank life by distributing the weight of a full load into a "hat section" with flanges covering more contact area than a "L" section sub-frame. The A style tank features a 36" x 42" x 12" refilling lid. A style tanks feature extra baffles, 4 point leaf spring hold down kit, full length built-in fenders, 4” full size bolsters, front and rear. Standard tank sizes available: 2000, 2500, 3600, & 4000 gallons. Custom Built up to 6400 gallons. What makes a McLellan tank unique? McLellan offers a variety of arrangements to best meet your crew's needs. Look below for information about some of our most predominant features. Eliminates tank bending, twisting, and vibrating by isolating the tank from the chassis. Contained within the subframe of the tank to raise it above minimum ground clearance.